BLM villa inspires purity, intimacy, simplicity and warmth, acting as a real character in its inhabitant’s lives and exerting an amazing transformation power over its visitors. Our client aimed to create a comfortable villa during all seasons, simple and abstract. The composition consists in two main brick lined volumes, and one corten steel volume; all connected by a rustic concrete slab. The “L” shape pedestrian pathway surrounding the library volume forces visitors to slowly discover the villa´s private spaces, unveiling the architectural composition step by step. Finishing materials were specified to be durable. Brick, natural concrete in floors and ceilings, local marble, rustic painting, corten steel, everything contributes to a future reality of low maintenance and relative auto-sustainability. Villa BLM was designed based on climate, existing on site vegetation, low cost maintenance and energy efficiency. The library and study spaces. The main frontal volume consists in a library of approximately five thousand books from the owner´s private collection. 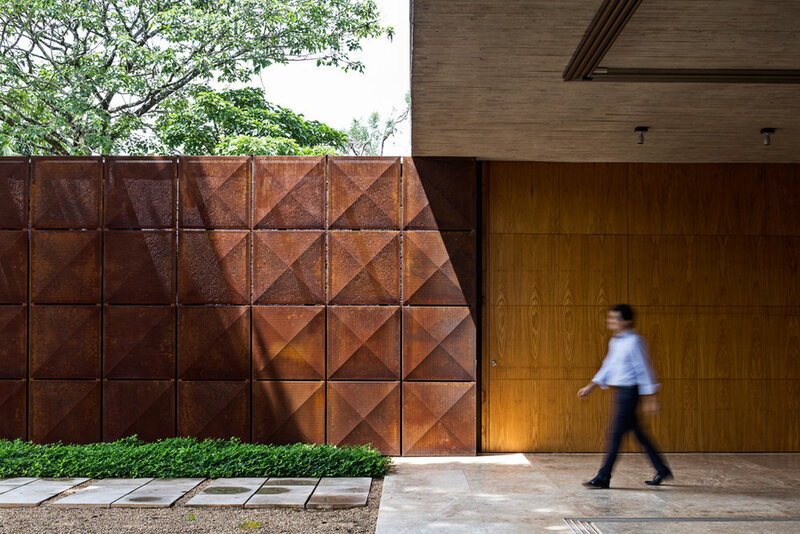 This ephemeral volume is entirely covered with perforated corten steel panels and plays an important role in respect to the villa´s main access.